This kind of only applies to people living in and around Astoria, New York, but if you’re interested in winning a free book, you’ve gotta be quick! Congratulations to Katrina of Queensland and Sophie of Quebec for scoring a free copy of ‘Addicted to Love’ through GoodReads. You lucky ladies were two of 591 entrants which are fairly high odds when you stop and think about it. I’d suggest you both buy a lottery ticket. In the meantime, your books are on their way. More comps coming soon, kiddies. Isn’t this exciting? GoodReads is giving away copies of ‘Addicted to Love’! Quick, you could score a freebie! This is precisely how you don’t want to be immortalised! I’m pleased to announce that the book whispering champion of the world is … Jenny Roesler, a super cool chick who was kind enough to mention my books to a group on Facebook because she dug them. See, I told you this competition was dead easy. Why didn’t you enter? 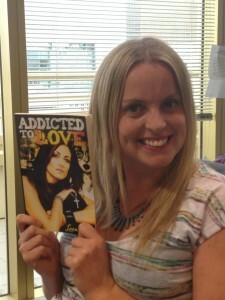 Jenny will shortly be the proud recipient of my brand new mini-memoir ADDICTED TO LOVE. Sure she didn’t win a yo-yo like another lucky reader, but this fledgling book is … um … even more up and down? I don’t know … something. Another competition will be forthcoming, but don’t let that stop you from spreading the word. Remember, if you want a freebie, simply tell someone about my books and let me know via my ‘Contact’ button. One of you will win my next mini-memoir, due out next month. Seriously, it’s a lot easier than going up against 600-odd people in an offsite comp, so why not take the plunge? Many people have been contacting me lately to say, ‘You know, Lana, my life’s lacking a certain je ne sais quois – the type of excitement that can only be derived through one of your competitions.’ I’m therefore pleased to announce the launch of … COMPETITION NUMBER TWO. For your chance to win a FREE copy of my brand new mini memoir ADDICTED TO LOVE, here’s all you have to do: mention my book/s to someone. That’s it. No one has to buy a copy. No one has to read anything. No one’s going to be shot in the face. Enter via the CONTACT button, top right. The winner will be announced soon. Good luck! My goodness. The GoodReads competition wound up amassing 839 entries all told, and the three lucky winners were all Stateside. Congratulations to Stacy of Indiana, Amanda of Colorado and Kathy of Pennsylvania. Your books are on their way. If you missed out this time, don’t despair. GoodReads will be giving away copies of ‘Kickstart My Heart’ in the very near future. But that pales in comparison to our onsite competition, which accumulated somewhere between 7 and 1,074,653 entries. To refresh your memory, the question was what article was described in Chapter 2 of ‘To Hellas and Back’ which distracted me from packing my bags. (It was a clever and cryptic competition, that one.) There were in fact two correct answers, being ‘yo-yo’ and ‘amazingly bouncy rubber ball’. 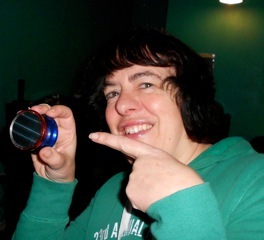 So I’m proud to announce – as confetti and balloons fall from the ceiling and we dance to Kool & the Gang – that the lovely Ms JANE of Southampton, UK, supplied BOTH correct answers and is now the proud recipient of the genuine article – my beloved yo-yo, which I’ve since bequeathed to her. Congratulations, Jane. I envisage many hours of unsurpassed entertainment. And if you don’t know how to do it, I’ll show you how to walk the dog (few know that ‘walking the dog’ is a genuine yo-yo trick, nor that the Rolling Stones were yo-yo aficionados). A new comp – set to rival even this one – will start soon. Watch this space. Only one week left to win one of three copies of ‘To Hellas and Back’ through GoodReads. There have been 349 entries to date, but you’ve got to be in it to win it and, let’s face it, this is your lucky year! In chapter two of ‘To Hellas and Back’, I describe two articles that sidetracked me from packing, one of which nicely ricocheted off bathroom surfaces. Name one of these articles for your chance to win one. It will be old and used. Your life will never be the same again.